I think you know that this semester I've been taking two classes at Fashion Institute of Technology (FIT): Draping IV (I skipped III but will probably take it the next time it's offered) and menswear patternmaking. 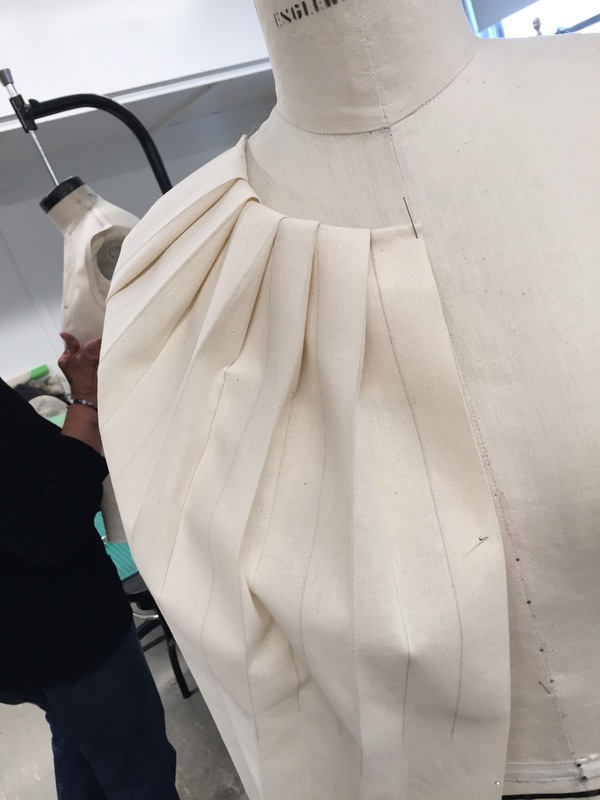 The draping class is very loose, meaning there are just a few things the professor is required to cover -- namely draping knits and doing a rub-off (i.e., copying a RTW garment) -- the rest of the time we work on our final projects at our own pace, and if we need assistance, the professor is there to help. The final (term) project must be completed by May 20th, which still seems far away. 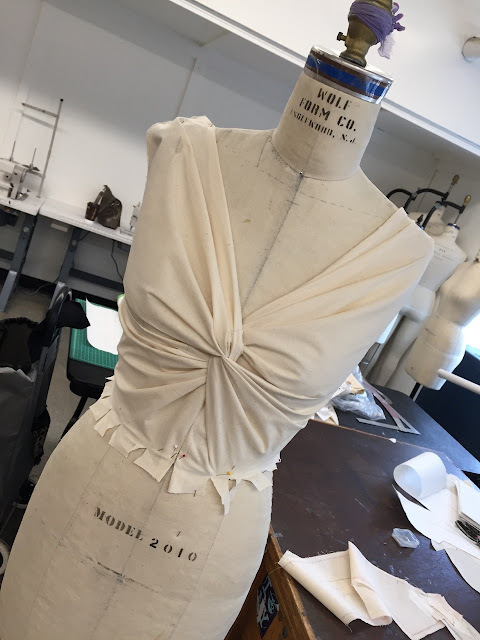 It's supposed to be a dress and a jacket we've draped ourselves or rubbed off from RTW (ready-to-wear). It can be woven or knit, any style, any fabric. Frankly, I wish the assignment had been more specific: when you can make basically anything it's hard to decide what to make! 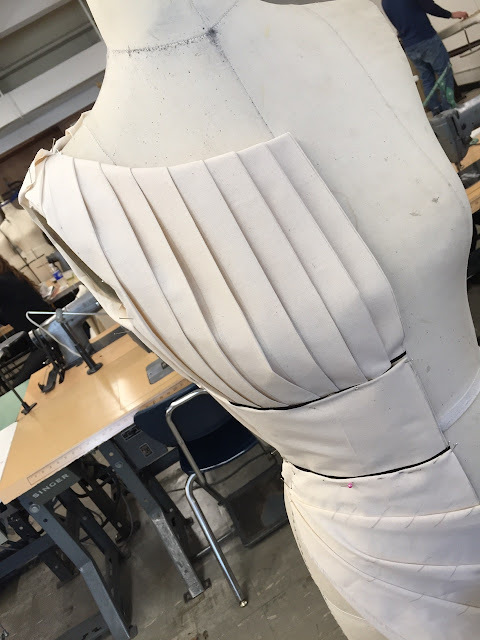 A recent pleated bodice experiment. I truly love draping as I enjoy letting the fabric guide me, rather than working from a sketch or a paper pattern, both of which, naturally, have their place. 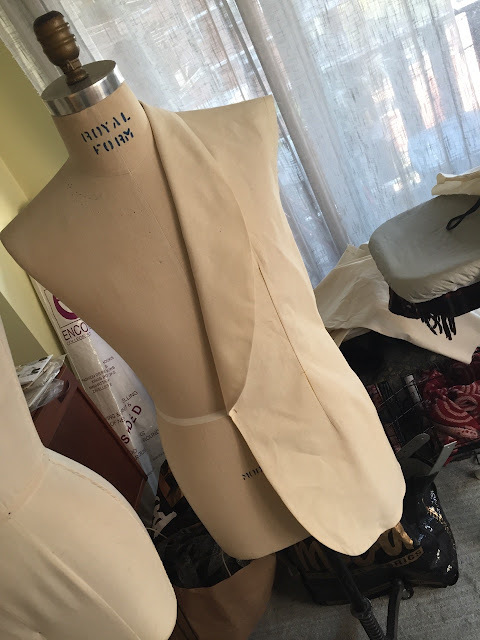 As you know, I didn't start draping till last year. 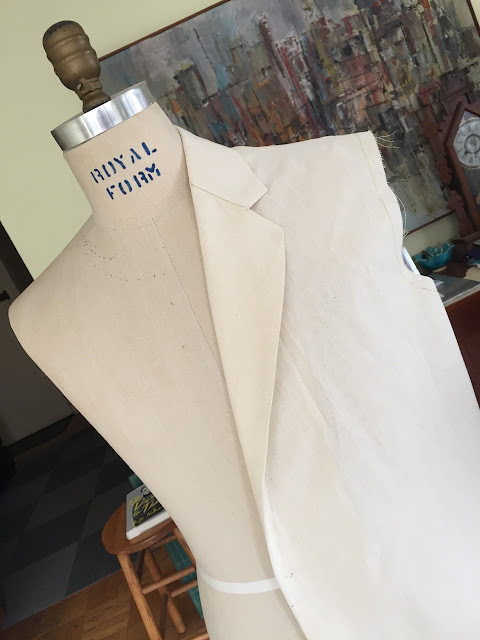 Meanwhile, in my menswear patternmaking class, after drafting a shirt, pants variations, and a vest, we're now working on jackets: notched collars, shawl collars, fitted jackets, etc. I'm getting a lot out of both classes and they're keeping me quite busy. It's fun to be in school: I'm inspired by my fellow students and the general atmosphere. 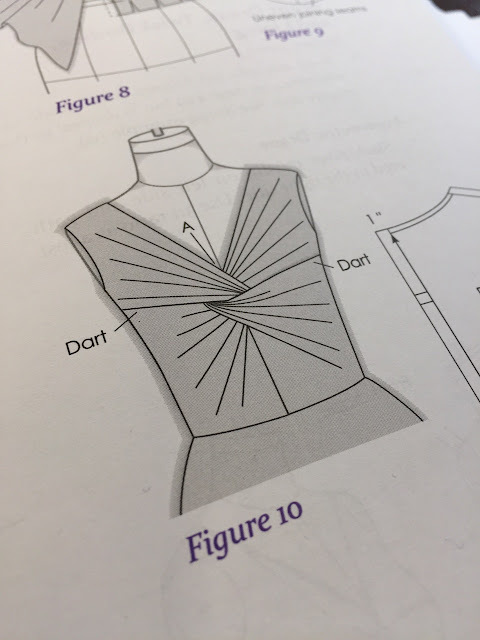 Anybody out there have a special uniform for sewing? If so, what is it? PS -- You can follow my daily exploits on Instagram! From the British "Ladies Garment Cutting & Making" by F.R. Morris (3rd Edition). Your draping and jackets look great! I have a sewing apron. 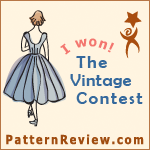 I made it from a vintage 60s simplicity pattern (6808). It's a half apron, and I added a few more stitching lines to make special-sized pockets for my shears, seam gauge, marking pens, etc. I even left one pocket big when I realized it was the perfect size to stash my current project's instructions in it. It's great because any loose threads or trimmed seam allowances fall on it, instead of my pants, so I don't have to use my lint roller so much anymore. But I will admit that I do forget about it a lot - I'm just too eager to get sewing to put it on! My intentions were good though - I think your uniform will work really well for you. The sewing uniform is probably a good idea. It reinforces good intentions and helps you concentrate. 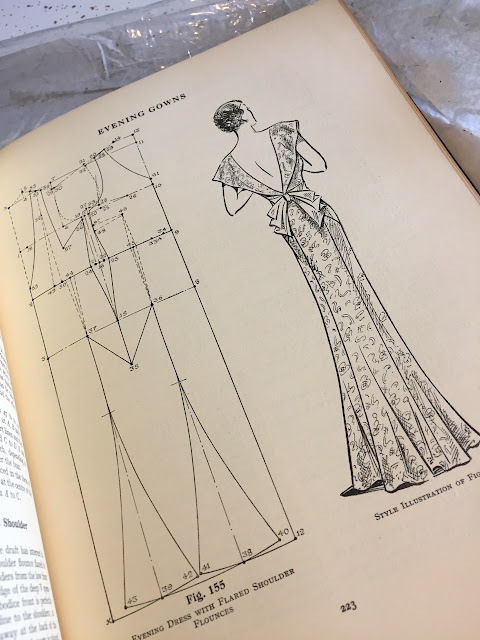 I was looking at the beautiful gown (1930s?) in the Morris book and I couldn't help wondering why we have given up elegance in favor of flipflops and denim rags. 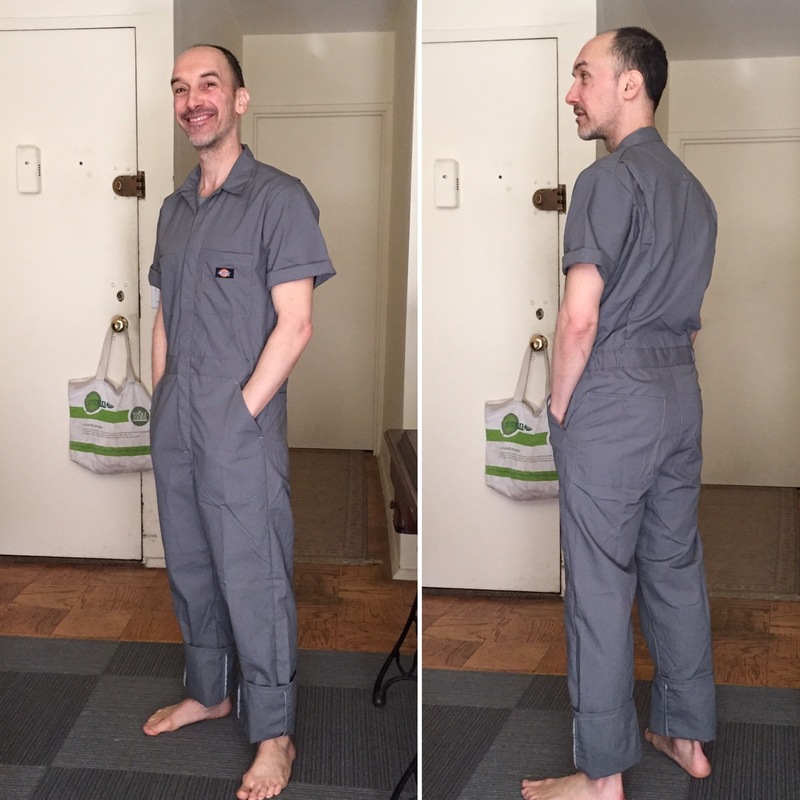 Let's all put on our uniforms and sew something wonderful! I am fascinated by twists. I cannot work out how to do them . I am wondering if you could take us through the steps that you used to get the centre twisted bodice . I know there are lots of different types of twists. 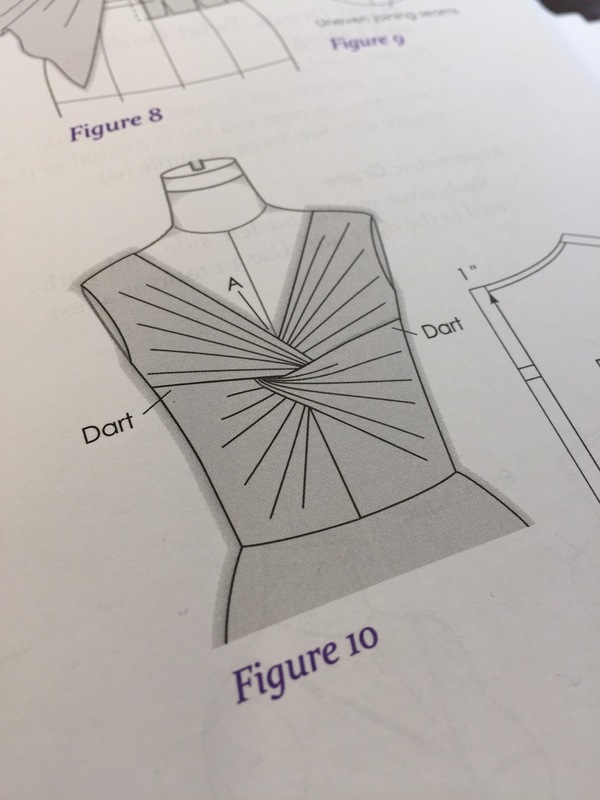 I have done a year of flat pattern making and while by no means an expert I can usually get there with a few muslins but twists I dont know where to start . I am very impressed !! Wow... I would love a class in doing a rub-off. There is nothing like that in Alabama that I have found. 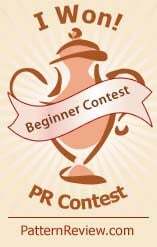 If you have any great tips to share on rub-offs please think of me and share them. 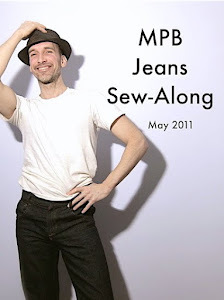 Regarding learning to do rub-offs, there was an article in Threads magazine not terribly long ago on copying one's perfect fitting jeans using the rub-off method. 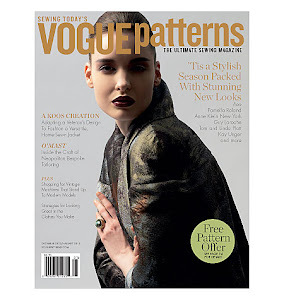 Back issues are sometimes available from the publisher. I tried but was not immediately able to put my hand on the exact issue number. Kenneth King's Craftsy class Jeanius is a great tutorial on doing a rub-off for jeans and you could easily adapt the process to any garment. I think he said that he developed it to help save some vintage Hollywood gowns. I loved reading this post and replies. I have just started sewing again after retiring. 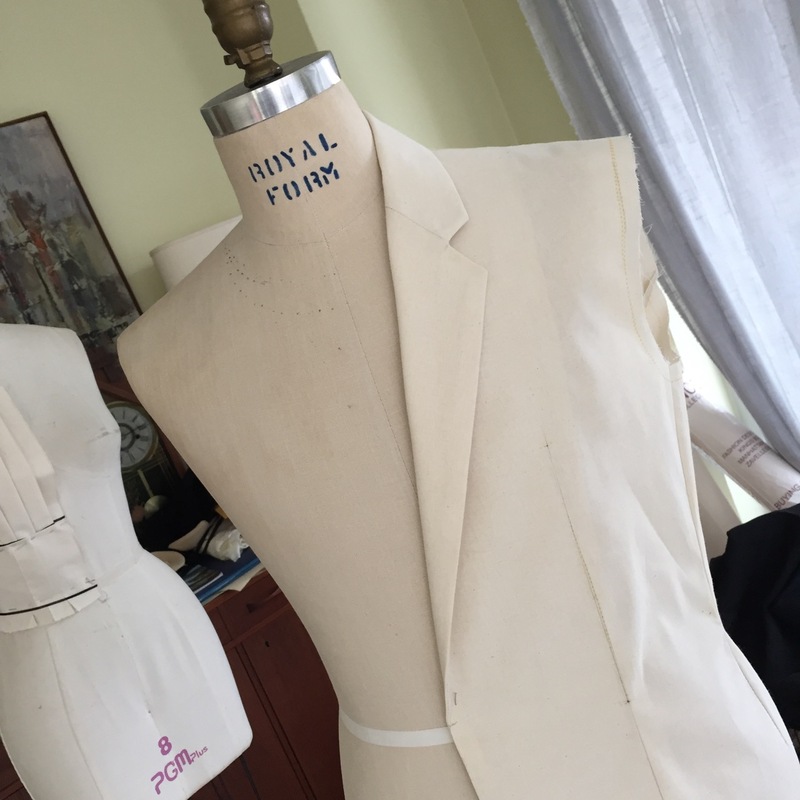 I read sewing post looking for updated tips and a sewing apron or uniform is one I would never have thought of on my own. Thank you! My tools are usually all over the table and I have to move them (or look for them) all the time. I'm going to get started on that apron right away. I love the idea of a 'sewing uniform'. 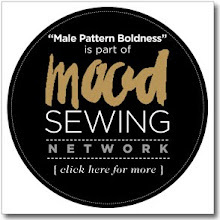 It's very practical, but also seems like a neat way to put yourself into a sewing mindset. Kind of like when you put on an apron for cooking. I sew in my underwear if I'm sewing clothes for myself. And only then do I bother with even underwear because it bothers my husband to come in the sewing room unexpectedly and see me nekkid. Do have to remember to have on clothing on the days I open the curtains in that room -- it faces the road and my strait-laced neighbor's house. Same here! SO much easier for fittings! Same. Birthday suit or drawers. Given that, since my daughter moved out of home, my sewing room is next door my 24 year old son's bedroom, my sewing uniform is... clothes. Doesn't matter what, so long as I'm dressed! 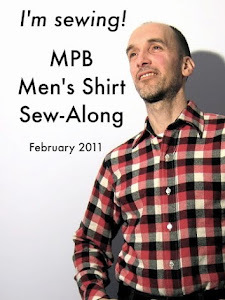 hi Peter,your blog is more than interesting and I found it by chance looking for a japanese shirtmaking book. I love sewing, particularly shirts for the men of my family. I read your posts about stright stitch vintage machines, do you think a modern straight stitch machine ( the juki TL 2200 mini for ex) can sew the same perfect stitch as your Pfaff 30 does? Sorry for being off topic... but thanks in advance. I'm sure the Juki is an excellent machine. Glad you found the blog! Beautiful work as always Peter! I wish I could sew everything I wear but I just don't have the time. I don't have a sewing uniform but I think it's a good idea! I found at a local Goodwill a very helpful book on "rub offs." Tracy Doyle's Patterns from Finished Goods, Sterling Publishing Co., NY, NY, 1996. Your work is really amazing. Your menswear drafting is very professional and I am really enjoying seeing your draping work. It's all very inspiring Peter! Other people in my house, and schedules to run out and pick up/drop off people make a sewing uniform impossible. I get more done when I'm fully dressed though. Weird, huh? I sew in my underwear as well, makes trying on my experiments so much easier. I can't imagine what my neighbor thinks, as I sew in the kitchen. Brick-and-Mortar Shopping -- YEA or NAY?